As I was reading the umpteenth article on the political “War on Women” I came across an article discussing the perils of maternity leave on The Nation‘s website. In “Too Often, A New Baby Brings Big Debt” the author, Bryce Covert criticizes, rightfully, the United States’ woeful policy on parental leave and worker protection in the advent of a pregnancy, all of which can result in financial hardship for working moms. Interestingly, was the author’s mention of Sonya Underwood, a hospital worker, to make her case. When it comes to taking time off for a new baby, the best-laid plans often go awry. Sonya Underwood had worked at a hospital in Atlanta, Georgia, for eleven years before getting pregnant with her third son. As a single mother, she prepared to cover the income she would lose during her unpaid leave, hoarding paid time off and taking out disability insurance. And then real life intervened. Doctors told Underwood that she had an incompetent cervix and put her on bed rest three weeks ahead of schedule. Then her son arrived at twenty-six weeks. The twelve weeks of leave she is guaranteed by the Family and Medical Leave Act (FMLA) soon ran out, as did the insurance, even though her son remained in the NICU. “I didn’t have any money left,” Underwood said. So she went back to work and visited him at the hospital every day. But once her son came home, Underwood’s situation quickly became untenable. Daycare centers wouldn’t take a medically fragile baby. Her human resources department informed her that her only choice was more unpaid leave. “It didn’t help out my situation because I still had rent due, my car note due, utilities, everything else,” she said. After she exhausted that leave, she was let go from her job, lost her car and couldn’t qualify for unemployment insurance because of her role as her son’s caretaker. The only places left to turn were Temporary Assistance to Needy Families and a loan she already knew would be difficult to pay back. “I’m a victim of FMLA because it didn’t help my family,” she concluded. Though I felt empathy for Underwood’s situation, one question stuck in my head throughout the article. Why did Underwood, a single mother of two, decide to have a third child? Though Covert mentioned Underwood had been working at the hospital for eleven years before deciding to have a third child and that she had “prepared” for the pregnancy – my initial thought did not go away. Some would argue that her decision to have a third child led to her economic hardship. Nevertheless, Covert’s argument about the unfairness of parental leave for working new mothers is inadvertently undermined and obscured by her use of Ms. Underwood as an example. Yet, whatever readers may feel about Underwood and/or her situation shouldn’t dilute the fact U.S. policy concerning parental leave for working new mothers and parents is abysmal. Pregnant women only have the option of hoarding their vacation/sick leave in order to have paid maternity leave with the option of using FMLA (which is unpaid) to extend their maternity leave. This is ridiculous when, according to the Center For Economic Policy and Research’s “Parental Leave Policy in 21 Countries” 2008 report countries such as Austria, Canada, Cuba, France and the U.K. offering 18-52 weeks of paid maternity leave and sometimes paid paternity leave. Not every potential mom is married, has a dream pregnancy where she didn’t get sick and has a child born completely healthy while working for a family-friendly employer, which fortunately was the case for me. Complications–medical, financial and otherwise–happen, yet America’s parental leave policy doesn’t take such matters into consideration for moms. In some instances, pregnant women have to deal with on-the-job pregnancy discrimination which can result in decreased work hours, job loss, failure to hire or promote and forced unpaid leave as reported in 2011 by the Equal Employment Opportunity Commission (EEOC). Also, The fear of debt has caused many potential moms/parents to delay having children and limit the number of children they would like to have. Why more Americans haven’t opted out of the parent route is truly a testament of nature over logic. The fact is, hoping that the latest “War On Women” round will push the federal government to resolve this issue (along with other concerns that primarily affect women) is the same as expecting to win the Mega Millions lottery. In other words women, don’t hold your breath or you might end up like Sonya Underwood. 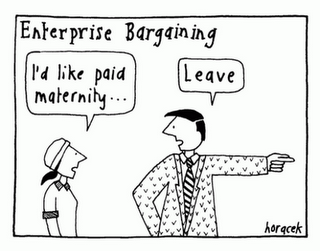 working leave for mothers here in the US is a joke! I was pregnant while working here in the US and was given 3 weeks paid leave at 100% pay, 3 more weeks at 60% pay and then 6 weeks at 0% pay. And yet, the government is more than happy to be in my womb telling me how to be pregnant? Funny that the concern for a fetus is around when it suits people but so not when it would actually help the whole family. I’m canadian and IF i had stayed in canada and had my child there after working for a year or two, then I would have been entitled to one full year of paid maternity leave.